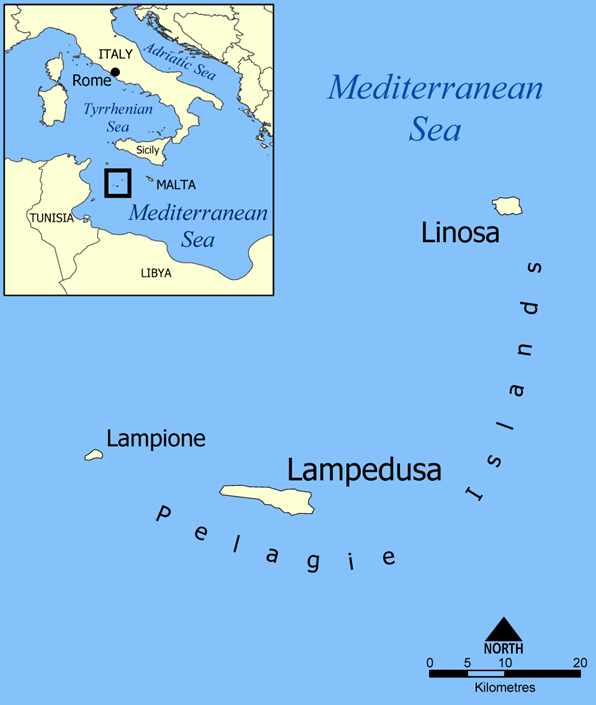 The tiny island of Lampedusa sits 70 miles off the coast of the North African nation of Tunisia, its nearest neighbor. But politically, it belongs to Europe – more specifically, to the government of Italy and the European Union. It is, in many ways, a quintessential borderland. For many African and Middle Eastern migrants and refugees, it is the closest path to survival and hopefully, prosperity in the European Union. It is seen by some as a paradise on the horizon. But that paradise is also a purgatory. The island houses a “holding facility” that takes in tens of thousands of migrants and refugees a year, dwarfing the local population. The relationship between these migrants, the holding facility, and the local inhabitants of Lampedusa, is very tense. On top of this, a changing climate, and its effects on water and food security in vulnerable states in North Africa, the Horn of Africa, Sub-Saharan Africa, the Middle East and Lampedusa itself, may exacerbate an already tense situation. Extended droughts, increased freshwater scarcity, changes in fisheries and other stresses, will put additional strains on populations in both the places of departure, and the destination. But the situation in Lampedusa is far more than a local concern. The small island, a key point of entry for many African and Middle Eastern migrants and refugees, is a microcosm of the complex relationship between the European Union, Africa, the Arab world, and environmental change, set on a virtually invisible island (if you look at a map of the entire Mediterranean, Lampedusa is no more than a speck in the blue). Lampedusa also speaks to much larger issues of historic civilizational tensions, global environmental change, and international security. As the European Union struggles to find solutions to its own internal crises, a worsening migration crisis to its south could have significant implications for it, and the broader international community. This small arid island is in many ways a picture of the future stresses the broader region is likely to experience. As the gateway into Europe for refugees in the region, it is a reflection of the needs of the people fleeing their home countries, the governance deficits in those countries, and the increasing demands on a supra-national entity, the European Union, which is struggling to make sense of the fragmented migration policies of its member states, and to chart a better course. In addition to the complex political, social and economic factors that drive migration in the region, there is also the increasing likelihood of climate change becoming an additional stressor. The European news website Euractive recently featured an article on the tragedy, making the case that “climate change will bring more Lampedusas.” Eritrea, the point of departure for many of the victims of the boat tragedy, is experiencing an increasing frequency of drought, which has piled onto other significant stresses related to poverty and poor governance. Climate change projections suggest an even drier future, which could further incentivize migration from the Horn of Africa to Europe. North Africa and the Middle East are also looking at a much drier future, as evidenced by a 2011 NOAA study linking climate change to increased drying since the 1970s – a phenomenon which contributed to deteriorating water security in Syria, hit hard by a devastating drought from 2006-2011. While there are obviously numerous social, political and economic stresses that lead to migration, unprecedented climate change, observed and projected in Africa and the Mediterranean, is very likely to exacerbate those stresses. Lampedusa may be small, and generally unheard of outside of southern Europe, but it provides us with a snapshot of the region’s possible future, and a warning to the international community about the need for more resilient governance in the face of a changing climate – including better policies on addressing migration. There is still time to prevent such a future, or at least mitigate its risks, but that window gets smaller every year. By Caitlin Werrell and Francesco Femia in climate and security on October 9, 2013 .